Palmer’s are doing hair care! I mean, I know they have done for a few years now but I can’t be the only one who, almost instantaneously, goes to cocoa butter and skincare when I think of Palmer’s… But yes, hair care products, and I recently had the pleasure of trying out a few of them. Now I wouldn’t call myself a product junkie but looking for products that might work for my 4B/4C hair could just about be my second job. 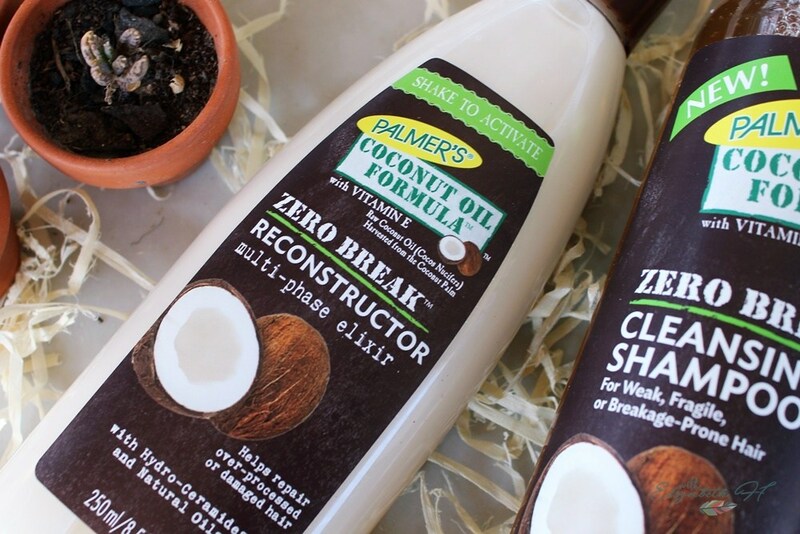 I recently decided to start co-washing again; returning to the regimens of my early transitioning days, so the products from Palmer’s Coconut Oil Formula range arrived right on time. My hair is on the drier side especially now that the weather is changing, so it needs as much moisture as possible.! I found that this conditioner was very thick creamy to the touch, it goes on easily and has a great light smell that is not overpowering like many other coconut oil products I’ve tried. However, I noticed that despite its thick and creamy formula, it didn’t provide much slip for my hair and so did not my detangling process any easier. Also during my efforts for slip, I found myself using more and more product and ended up using the whole tube in one wash. Once my hair was dry and moisturised it did feel quite soft and had a bit more some shine to it. Also the light scent did linger for a few days, which was great. I did however follow up with Palmer’s Zero Break Reconstructor during the week. This shake to activate product is a mixture of coconut oil other protective oils such as Tahitian Monoi, sweet almond infused with a Ceramide cream. It’s a light and almost mist-like consistency but also provides moisture as well as shine and is not greasy. It kept my hair rejuvenated between wash days but I haven’t quite noticed if I have less breakage just yet, but I am hopeful and will keep using. In the winter months, daily moisturizing is key to maintaining healthy curls. After co-washing and detangling your hair, apply a moisturizer like the one below by Cantu. It’s oil based and contains shea butter and vitamin E! Reapply your moisturizer as needed, even if it’s every night. I’m already a fan of Cantu Shea Butter products so I was excited to try this product because having 4B/4C hair, I tend to gravitate to products that state they can define curls and maybe just one day I’d be able to achieve a successful wash and go. A girl can dream right. So I tried this product two different ways. First was after a wash on damp hair as the directions indicate. I like the smell, the product itself is a lot lighter in texture than I expected for a curl defining cream and while it did eventually manage to give some definition it did take quite a long time to dry. once dry there was some white residue left in parts of my hair. However using the product on dry hair I actually got better results. My hair felt very moisturised but not greasy. It might just be me but I’m sure my hair looked slightly more defined that it did after the damp hair attempt and no white residue!